The world’s largest online shopping festival, Singles’ Day, is about to galvanize China’s retail scene. Six times bigger than Black Friday and Cyber Monday by the worth of sales generated, the event saw Chinese consumers spend a whopping £14.2 billion in 2016. Otherwise known as shuangshiyi (Double 11 Day), the 11th November event began as a celebration of singledom among young Chinese. In fact, the date 11.11 was chosen as it resembles bare sticks or guanggun, a term for unmarried men in China. Today, however, it is a national shopping festival for everyone. Alibaba, the e-commerce company that founded the event, has stretched it into a three-week affair with retailers offering advanced discounts leading up to the 24-hour finale. Competing retailer JD.com also jumped on the bandwagon and created it’s own Singles’ Day. Singles’ Day doesn’t just attract Chinese companies: among the 140K retailers participating, 43% are Western brands. The likes of Guerlain, Adidas, Estée Lauder and Victoria’s Secret feature in this year’s fashion show, ‘See Now, Buy Now’, which fuses entertainment, e-commerce, and media. So how can Western brands take advantage of China’s Singles’ Day? Here, in this five-step guide, we outline how to build a presence and navigate the complex Chinese shopping ecosystem: how to localize your pricing strategy, and why it is important to monitor your campaign in real-time and identify influencers who can help boost brand exposure in a crowded market. The first step is to establish a branded online store so consumers can purchase directly within the mobile shopping apps Tmall Global and JD Worldwide. These are the leading B2C platforms for international brands entering the Chinese market. Tmall, with 57% of the overall market share, is the more established of the two. Attracting over 1bn total visits this September alone, the site was set up in 2014 to encourage big international brands to enter the Chinese market. Last year, Siemens, Philips, Adidas, Jack Jones and Only were among European brands active on Tmall. While JD Worldwide is smaller and has 188 million active users. It distinguishes itself from Tmall Global by selling good-quality home appliances and electronics. Brands such as Sony, Lenovo, Sennheiser, and Blackberry have a strong presence there. International brands will be required to undergo a registration process which involves a minimum deposit of £1,502. Nike’s online storefront: "11.11 discounts as low as 50%"
Due to factors such as accessibility and affordability over PCs, mobile usage in China has skyrocketed. 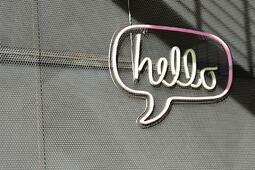 But it is the birth of the popular all-in-one messaging app, WeChat, that dramatically shifted usage to mobile. Unlike Western consumers who begin their journeys with a search engine, Chinese shoppers start with a mobile shopping app (Tmall/JD.com), engaging with brand content, interacting and sharing recommendations with friends before making a purchase. This experience has been referred to as “highly personalized discovery” by Boston Consulting Group (BCG). As a result, it is easier, faster and more convenient to shop. Brands could shift their retail strategies away from SEO, driving traffic from other channels like social to the apps and working with high-reach individuals to increase brand awareness. Chinese mobile shopping apps are highly interactive and optimised for engagement. Consumers can join chat groups, watch live streams and share recommendations with friends, all in one app. This means there are a constant discussion and appraisal happening around products. As these apps are linked to WeChat and Weibo, there are opportunities for brands to extend their reach offsite. A Singles’ Day activation on WeChat, where users can read branded content, could have a significant impact. China’s Singles’ Day promotes consumer engagement by integrating offline and online shopping experiences. The fashion show ‘See Now, Buy Now’ is an example of this; broadcast on seven channels including Weibo, Taobao, and Tmall shopping apps, consumers are prompted to make a purchase via an inspiring visual showcase. 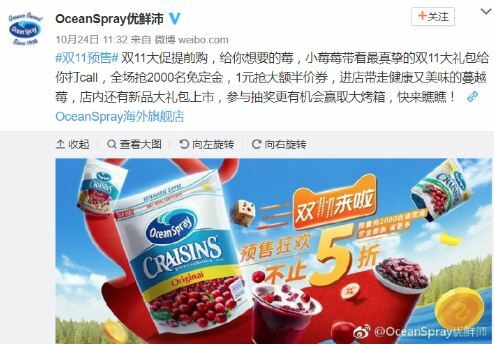 Ocean Spray promotes advanced sales with its large pack of Craisins. The first 2,000 to take advantage of this offer will not be asked for a down payment, which is required to a win a half-price voucher. Implementing the right pricing strategy is key, aiming to discount products at the optimal time. Chinese consumers treat the shopping festival as an opportunity to make big purchases of high-quality products that are heavily discounted. This is because, according to Frontier Strategy Group analyst Joel Backaler, “they cannot trust product safety and authenticity domestically in China”. As part of its wider strategy, Alibaba keeps consumers entertained with celebrity events, live-streamed talk shows, and games. Online competitions, in particular, are popular for encouraging the urge to “mai, mai, mai” - or “buy, buy, buy” – a popular internet phrase coined in 2014 by shopping addicts. 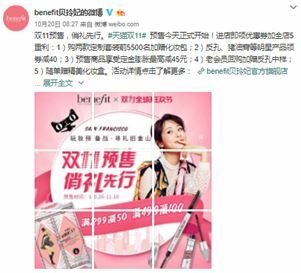 Cosmetics brand Benefit tapped into this by running a competition on Weibo, in which the first 5,500 consumers who purchased a special package won a free makeup bag. 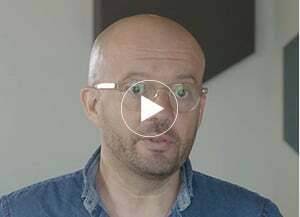 This was part of an advance sales strategy ahead of 11th November, which included five special deals. Having a pricing strategy that paces shopping activity helps to build an appetite for larger discounts later on, and avoid a logistics breakdown on the big day. 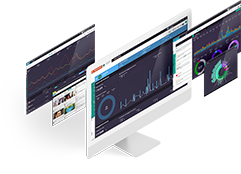 Monitoring your campaign and engaging with shoppers in real-time will make the difference in distinguishing your brand from competitors. It isn’t enough to have an online presence within a Tmall Global or JD Worldwide store in order to appeal to a local audience. Working with influencers could amplify brand awareness. This strategy will help boost reach and brand awareness, especially in a market where fans place a high-level of trust in celebrity influencers. Lunch with Mr. Alaia. He is so nice and he still keeps his childish mind. He hit my leg in the back to scare me, right after I saw his dogs. ?? Mr. Bags, a WeChat influencer specializing in luxury designer handbags partnered with Givenchy this February, helping sell 80 handbags priced at 14,900 yuan (approx £1,710) in just 12 minutes. This huge result was attributed to the buying power of his fans, illustrating how brands can convert digital influence into sales in China. 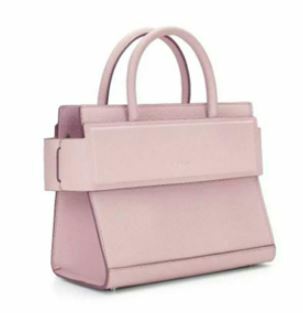 The pink Givenchy bag priced at 14,900 yuan sold out in 12 minutes. 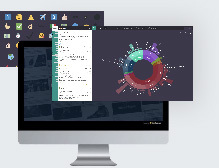 Social listening is a valuable tool in identifying and activating these influential individuals. 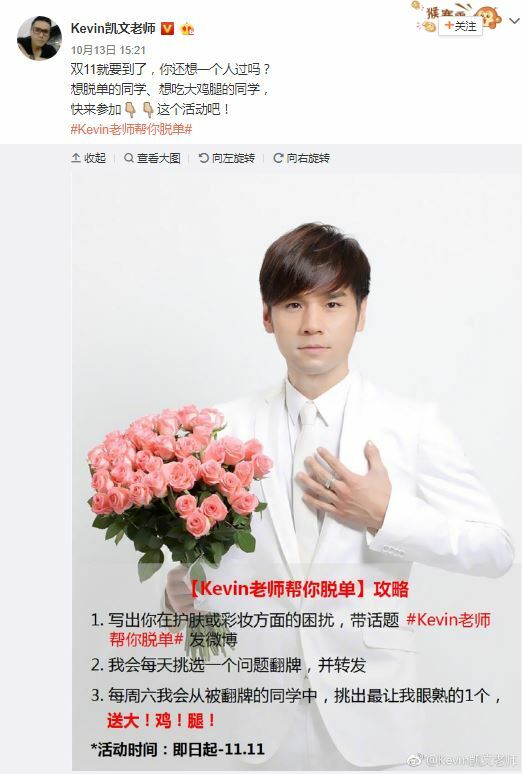 Using Linkfluence’s social intelligence solution, we identified that one of the top influencers talking about Singles’ Day so far is Kevin Kai Wen, a Taiwanese celebrity stylist who boasts 55m followers on Weibo. Appealing to singletons looking for a relationship, Wen invited fans to share their skincare and makeup questions using his custom #TeacherKevinHelpsYouToBreakFreeFromSingledom hashtag, followed by 53 million people. With a broad potential reach, he stands out as a good potential partner for beauty brands looking to gain traction during Singles’ Day. China’s hottest male actor and singer, Hu Ge, is also among those engaging with the festival. 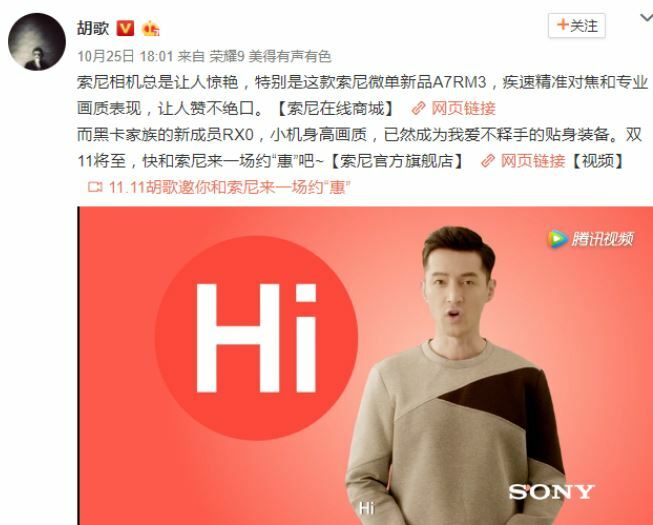 A 16-second video posted to his Weibo account (57.4m followers) endorsing a Sony camera, linking to purchase details, has been viewed 5.9 million times to date. Knowing how to position your brand in the Chinese e-commerce landscape is an exciting challenge for brands and one that should be approached carefully. However, these five steps will help ensure success. 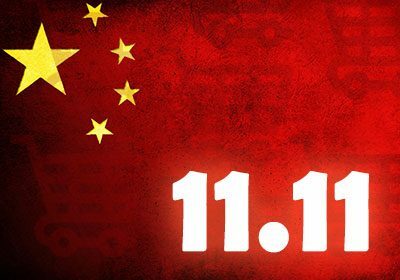 As Singles’ Day gains momentum, 666 million consumers have used the official hashtag #the Double 11 Day has Come#,#双11来了#. It’s time to act! If you are interested in hearing more about China’s Singles’ Day and how to make use of it through social data monitoring, Linkfluence can help. Please, get in touch!